The incantation that kicks off Detective Cooper’s dream vision in Twin Peaks is part abstract clue and part divination, and occult elements reoccur through the David Lynch-Mark Frost created series. So it makes sense that pop artist Benjamin Mackey would look at combining characters from the show with the designs of the well known and well loved Rider-Waite-Smith Tarot deck from 1910. 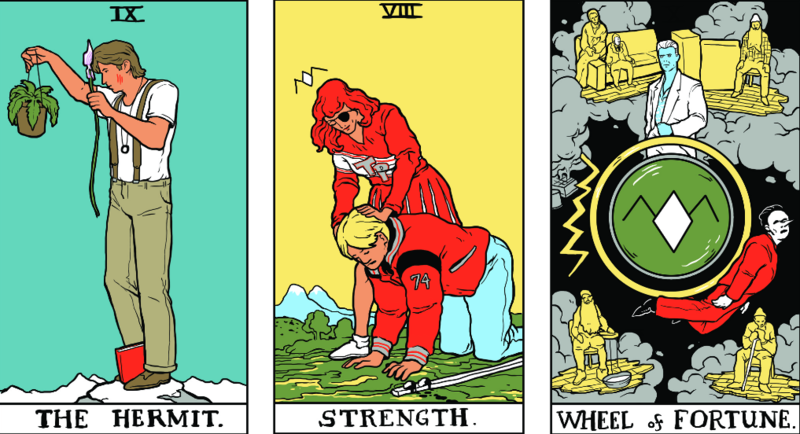 Not too surprisingly considering the show's devoted fan-base, the Twin Peaks Tarot was a hit, and Mackey focused on completing the full deck of 78 tarot cards (view them all here), riffing on the Rider-Waite-Smith deck’s penchant for enigmatic and mystic tableaux. And now, 10 months later, he’s offering the entire deck for sale through an Indiegogo campaign for what looks like a very affordable price. The initial campaign ask of $5,000 was reached within days, and now is heading towards $50,000. There are also extra goodies too for those who want to give more, including a booklet and an original sketch. 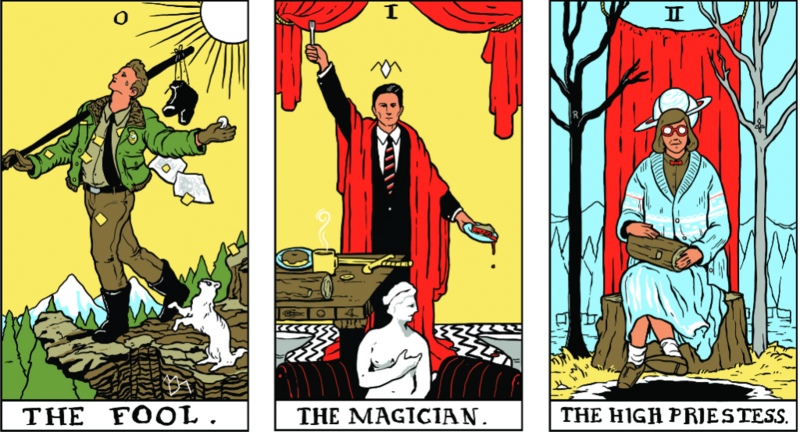 The Minor Arcana shows Mackey’s deep love for the television show and film, and gives a chance for even minor characters to have their own card, from Lili with the Blue Rose to Donna Hayward’s sister Harriet. "The Magician Longs to See" decks are scheduled to arrive by December, just in time to help you tell your friends’ fortunes while reading the upcoming Twin Peaks book, waiting for the new series, or drinking some damn fine coffee. are these tarot cards available to purchase. I have looked at several sites, really love them and want to order but do not see that they are for sale. Please let me know. I would love to own this deck, but for one thing. The caricatures do not look like the actors in the TV show. What a shame!